Although roses are beautiful and fragrant, they eventually lose their petals and die. If you received roses for a special occasion, such as an anniversary, dry them so they'll last for years. The drying process takes approximately one week and requires common household items. 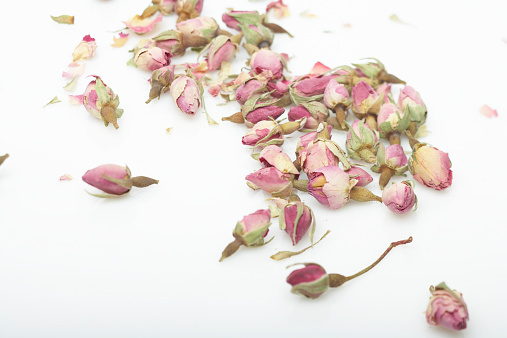 Once the roses are dried, add hairspray to maintain the color and keep the petals from falling off. Roses maintain their beauty for years if properly dried. Place the stems of the roses together, and then tie the roses into a bundle. Wrap the string around a coat hanger so the roses hang upside down. Place the hanging roses in a warm, dark, dry area, such as a closet. Allow the roses to completely dry, which usually takes about one week. Spray the roses with a light mist of clear hairspray, allowing the hairspray to dry. Once the hairspray is dry, remove the string and place the roses in a vase or storage container.